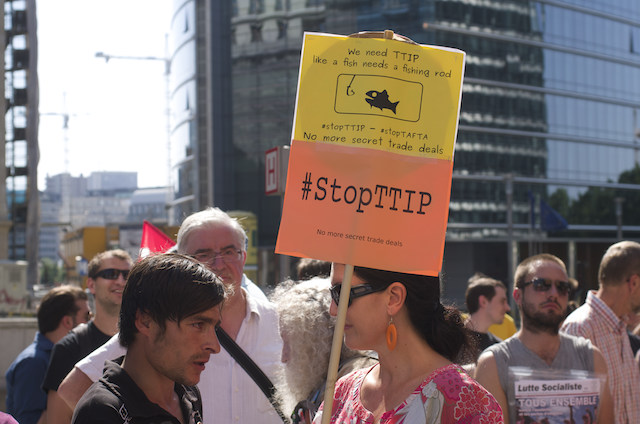 In January, the EU executive stopped trade negotiations with the US on the ISDS mechanism. It launched the online consultation in March after widespread criticism of the clause, which will allow EU and US based corporations to directly sue governments at international tribunals. The online consultation sparked “very substantial interest”, the Commission said. More than 99% of the 149,399 replies came from individuals, with a particularly large number submitted in collective actions by civil society organisations. The Commission said it would analyse the replies before it explained the next steps it would take. That is unlikely to happen before November, it added. Most replies were from the United Kingdom (52,008), followed by Austria (33,753), Germany (32,513), France (9,791), Belgium (9,397), the Netherlands (4,906) and Spain (2,537). The recent public consultation into the review of EU copyright rules, which closed in March this year, only had about 9,500 replies. More than 11,000 messages to a dedicated email address were also recorded. The Commission said it had “generated broad interest”. In a press release on Friday (24 July), the executive said it was, “one of the highest response rates ever for a Commission consultation”. A 2013 public consultation, lasting three months, into whether the EU should regulate fracking – the extraction of shale gas – generated 22,000 replies, a figure dwarfed by the TTIP response. Preliminary findings showed 569 organisations gave their opinion on the investment protection measures. 180 were non-government organisations (NGOs), 22 umbrella NGOs, 42 were EU trade union organisations, and 11 were government institutions and regulators. 66 trade associations representing EU businesses, 66 companies, 42 law firms, 15 consultancy firms also answered. 738 respondents, 0.5% of the total replies from businesses and individuals , admitted they had made an investment in the USA. More than half of the respondents (79,444) refused to allow their contribution to be made public on the Commission’s website. But 91.39% of the organisations and 39.37% of individuals agreeing to the publication of their reply, also agreed to their name being published with the contribution. The preliminary findings were released last night by the Commission. It follows last week’s sixth round of negotiations over the landmark free trade agreement in Brussels, which were greeted with protests. The consultation was built around twelve issues, including the scope of the investment protection provisions, transparency in ISDS, multiple claims and relationship to domestic courts, ensuring consistency of rulings and the appeal mechanism, and reducing the risk of frivolous cases. Unions, environmental groups and MEPs, including Bernd Lange, the German Socialist Chairman of the European Parliament’s trade committee, have called for ISDS to be dropped from TTIP. Former Spitzenkandidat Ska Keller has called for the talks to be dropped altogether (here). They argue that ISDS could be used by multinational corporations to bypass national courts and whittle away EU standards and regulations across a range of policies from the environment to food safety to social protection. The talks have also been dogged by accusations of a lack of transparency. The link by Kash shows that the so called: “stakeholders briefing” only allows participation on terms defined by the organisers. It was clear that some/many people in the hall supported the people standing up (given the round of applause that followed their ejection). The usual assertions then followed “increase jobs” – proof please, “we welcome debate” – that needs to have added to it “but reject protest”, “Transparency” is a word much used by TTIP supporters – that being the case then why not publish the mandates as the protesters want? TTIP is stuff and nonsense propagated by people with a vested interest in de-regulation in Europe that will lead to poorer quality employment, lax environmental rules (possibly none) and so on and so forth. There is no significant hindrance to trade between the EU and the USA supporters of TTIP have yet to show that this is the case, what we are left with is a “treaty” that will undermine the rule of law in Europe and replace it by the rule of opaque tribunals.